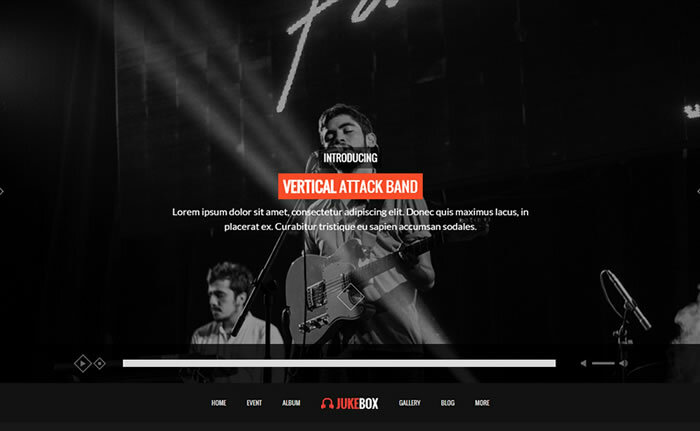 JukeBox is dark scheme, modern, responsive WordPress theme suitable for music, bands, artists, musicians and more. Designed using bootstrap 3 framework and included with various jukebox features helps you to build powerful music and band website without no hassles. Built with events manager WordPress plugins to manage the upcoming events for music troops and included with HTML5 video / audio player. JukeBox music and band WordPress theme featured with LESS preprocessor extends the CSS language, adding features that allow variables, mixins, functions and many other techniques that allow you to make CSS that is more maintainable. JukeBox has various events, portfolio and album templates which is very handy to built your music and band website like pro.